What better way to celebrate Halloween than with a tale from DC's Gothic romance series The Dark Mansion of Forbidden Love? 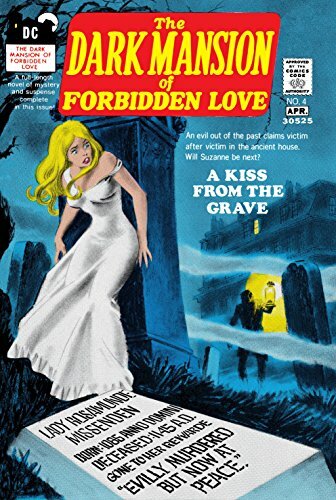 With a story by Dorothy Manning, pencils by Ernie Chan (credited as Ernesto Chua) and inks by Vince Colletta, "The Grey Lady of Coburn Manor" is just the right mix of spookiness and romance for a cold October night! The story of the last issue of the cross-genre series begins with a young American couple drawn to the supposedly haunted Coburn Manor -- a place the local Brits fear and avoid at all costs due to the legendary "Grey Lady." Though the sprawling estate does intimidate Suzanne and Brian to an extent, their business interests for the Spelton Hotels takes top priority. Suzanne and Brian settle in to their new surroundings and are served dinner by the broody butler -- Lionel, who is none too keen on their presence or their plans for the estate. During dinner they inquire about the owner of the house (Lord Wittlesey) who is absent, as well as the last representative of the hotel who mysteriously disappeared from Coburn Manor, never to be seen again. With day one of their exhausting and bizarre trip at an end, Suzanne and Brian engage in a little well deserved romance. After the two part ways for their separate bedrooms, Suzanne begins to have frightful dreams of Lionel, but is awoken by footsteps creaking outside her door. In a panic, she begins to call for Brian who rushes to her side. Convinced she is being stalked by the Grey Lady, Brian takes Suzanne's hand and guides her through the mansion to show her there is nothing to fear. But he is wrong! Very wrong! Upon her encounter with the Grey Lady, Suzanne is left feeling spooked, but carries on her work with Brian preparing the soon-to-be-hotel for the contractors. One afternoon, Suzanne and Brian invite a contingent of important people in the community over for tea to address concerns about the hotel. Lord Wittlesey and the local Vicar join them, as well as the president of the preservation society -- Lady Dunhill, who is most skeptical of what she feels will be a "neon-lit hot-dog haven for tired tourists." As Lady Dunhill continues to voice her aversion, the Vicar suddenly takes ill after having a sip of sherry served by Lionel. Everyone is most surprised when he drops dead right on the table. After the Vicar's death, Suzanne wants to leave Coburn Manor and the Grey Lady behind. Brian convinces her to stay for at least another week, in hopes that they can uncover the mysteries of the "haunted" house. Suzanne agrees and tries to make a go of it, but is again given cause to worry when Lady Dunhill turns up murdered in the Manor's garden. At an inquest concerning the two sudden deaths, everyone from the gardener to Lord Wittlesey is suspect. Ultimately, the unproductive inquest is adjourned. Later that evening, the maid finds the Lordship having a stroke and everyone is put on house arrest while the house is guarded by the police. Suzanne is again convinced the Grey Lady is the culprit. Brian decides to do a little detective work that evening and comes across a secret room. Inside the room he finds a jacket and watch that belonged to the former hotel employee who disappeared, and Lady Dunhill's ring. In the room Brian also finds a gigantic grey cloth and a pair of stilts, which he can only infer belongs to whoever is perpetrating the Grey Lady myth. Locked in the mystery room, Brian escapes just in time to save Suzanne from a shadowy figure on the attack. A "furious battle" ensues and Brian and Lionel the butler take down the intruder, who is... get ready for it... the elusive Lord Wittlesey! The Lord explains his wrath as a result of "bloody American swine" trying to buy their way into 700 years of nobility. Loyal Lionel, always protective of the manor is appalled as the Lord explains his justifications for faking his own stroke and killing the first hotel representative (George) and then the meddling Vicar and Lady Dunhill. After recovering George's body, the Lord is taken into police custody. Suzanne and Brian pack to leave in order to get married and take their honeymoon, but Brian assures Lionel that with the mystery of the Grey Lady solved, they will be back to Coburn Manor! While you ponder the fate of Brian and Suzanne, I will leave you with "Through the Keyhole of the Dark Mansion" -- an advice/letters column exploring issues such as ESP and foreboding dreams! Here's to wishing you a happy and romance filled Halloween!!! Interview with Charlton Romance Comic Book Artist, José Luis García-López!